After going through Corruption Prevention and Combating Bureau’s past investigative activities, the bureau’s chief – Jēkabs Straume – found it confusing that officers often took no appropriate actions after acquiring evidence or receiving indications regarding necessary steps. In an interview to Ir magazine, Straume said he has performed a small evaluation of what the bureau has done in the past several years before he became chief of the institution. During this evaluation, he says he found not a single event when something was done illegally. Nevertheless, he did get confused over the reasons why in some cases officers failed to ensure an appropriate reaction after acquiring evidence or indications about necessary measures. «I will ask [former CPCB investigations head Juris] Jurašs if I get the chance. It is clear we will continue working with current cases and materials acquired in past investigations,» Straume told Ir magazine. He also admitted that charges raised against Bank of Latvia governor Ilmārs Rimšēvičs and businessman Māris Martinsons are a result of re-assessment of old cases. «Officers entrusted with those cases came and reported – yes, there are a couple of cases in which investigations were not performed,» CPCB chief said in an interview to Ir magazine. He also confirmed that testimonies of two important witnesses were integral in raising charges against Rimšēvičs and Martinsons, as well as the recorded conversations in Taureņi public bath in 2013. Other evidence was acquired in four months’ time. When asked if Jānis Miķelsons, whose apartment was searched in 2014 in relation to so-called Martinsons or «construction case», continues working in CPCB, especially considering that his civilian wife Anta Dišereite is also an accountant associated with Martinsons, Straume told Ir magazine he has no right to comment on this matter. Nevertheless, he mentioned «any indications regarding the bureau’s employees will be carefully evaluated». «This matter should be viewed in a broader perspective. This is not just a question for CPCB. It is clear the bureau will have to make sure in the future that its officials are honest. At the same time, all employees are issued with special permits to work with state secrets. Permits are issued by Constitution Protection Bureau, which evaluates each case individually. The case for which information was reported last week – that one of the bureau’s employees is guilty of information leak – needs to be checked,» Straume told Ir magazine. As reported, Diena had previously reported that information regarding people associated with Martinsons had been leaked from CPCB, and because of that the investigation in the ‘construction case’ and the case against Rimšēvičs had failed. Meanwhile the former CPCB operative and current Riga City Council Jurašs mentioned on Twitter that the leak did, in fact, take place. However, it happened in Finance Police. CPCB, on the other hand, provided assistance to contain the situation. On 18 June, CPCB sent materials of the criminal case against Rimšēvičs and Martinsons to the prosecutor’s office for commencement of criminal prosecution. Shortly after, the prosecutor’s office raised charges against Rimšēvičs on suspicion of bribery. Charges against Martinsons were raised in regards to supporting bribery. The prosecutor supervising the case Viorika Jirgena had previously mentioned that CPCB commenced this case following a request from two AS Trasta komercbanka shareholders. She added that both shareholders are part of the criminal case. Both are bribe-givers who have been relieved of criminal liability because they confessed their crimes voluntarily. Jirgena adds that one of the shareholders asked Rimšēvičs to assist in matters associated with Finance and Market Commission in 2010. In exchange for his assistance, Rimšēvičs was offered a paid vacation in Kamchatka. In 2012, the same shareholder together with another one turned to Rimšēvičs again with the same request. As payment, Rimšēvičs requested EUR 500,000 to be paid in two parts – one half before FCMC’s decision and the other after. The prosecutor added during a press briefing that after the 2010 agreement Rimšēvičs had provided numerous consultations to the Trasta komercbanka shareholder, attempting to influence FCMC’s decisions. Consultations were provided after the 2012 agreement as well, but even though Rimšēvičs had succeeded influencing FCMC’s decisions, which was beneficial to his ‘client’, there had also been decisions that were not beneficial. 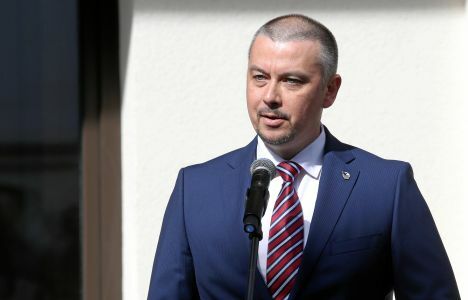 One of the forms of assistance Rimšēvičs had provided the shareholder was helping prepare answers to questions from FCMC in regards to the bank’s profitability and matters associated with non-residents. Jirgena explained that Rimšēvičs had failed to do what he had promised. Because of that, he was only paid EUR 250,000. According to the prosecutor, Martinsons played the part of the mediator in this case. He was also paid 10% of the bribe’s amount. The prosecutor adds that the bribe was paid in cash.